It doesn't take a leap of imagination to see why so many of North America's native people once considered albino animals to be emissaries from the spirit world. Rare and often strikingly beautiful, true albinos are characterized by two features -- ghostly pallor and pink eyes that, in some lighting conditions, can appear as red as fiery embers. The more prosaic truth of the matter is that albinism is a medical condition whereby an animal's body is unable to manufacture melanin, the pigment responsible for normal coloration of eyes, skin, fur, feather and scales. Since the gene that causes albinism is recessive, in order to produce albino offspring, both parents have to be carriers. Two variations of the condition are seen among animals: pure albinism, which renders the entire animal white or pink, and partial albinism, which might present itself as white patches on fur, feathers or skin. According to the Missouri Department of Conservation, albinos have been reported in North America in about 300 species of wildlife -- reptiles, amphibians, mammals and birds. Not all white animals are albino, but many animals with some coloration are -- the eyes are always the true indicator. If an animal has normal-colored eyes, it's not albino, no matter how white the rest of it is. Without melanin, light entering the eye through the irises illuminates blood vessels in the eyeball, making the irises appear pink or even bright red. Depending upon the way light hits the irises, the eyes of an albino animal can also appear light blue or light green. Sometimes, this effect can be extremely beautiful -- think of the ice-blue eyes of Siamese cats -- but when eyes lack melanin, the problem is more than merely cosmetic, especially for animals who spend a lot of time in bright sunlight. This pigment plays an important role in helping to protect delicate eye tissue from overexposure to the sun's rays. In normal eyes, melanin does more than act as a natural sunscreen -- it's essential for the normal development of irises, retinas, eye muscles and optic nerves. According to "Young Naturalist" magazine, the absence of melanin in the eyes of albino animals puts them at risk for structural defects leading to impaired focusing, depth perception and tracking ability. Without camouflaging coloration, an albino animal is already dangerously conspicuous in its natural habitat, and vision problems compound its vulnerability. For predators, poor eyesight will have a negative impact on catching prey. For prey animals, limited capacity to see a predator coming in time to escape reduces chances of survival. The exotic beauty of Siamese cats springs from the human manipulation of feline genes for partial albinism. Kittens are born either white or cream-colored, developing dark "points" on the face, tail, paws and ears later. As "Young Naturalists" explains, this particular gene variation allows for the production of more melanin in the coolest regions of the animal's bodies -- the extremities. 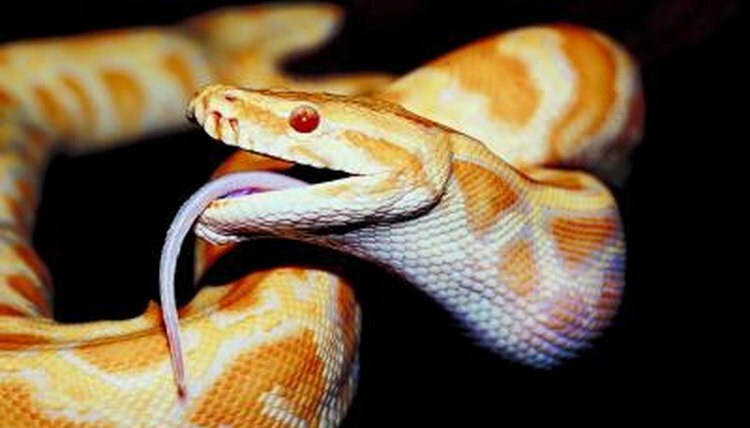 In the pet trade, albino snakes fetch higher prices than normal ones, so reptile breeders have been busily encouraging albino adults to make lots of albino babies. In 1966, a snow-white baby gorilla was found clinging to his dead mother in Equatorial Guinea. To date, Snowflake, who lived at the Barcelona Zoo for almost 40 years, is the only known albino gorilla. With white hair, pink skin, pale eyes and problems with his vision, Snowflake, right to the end of his life, was the quintessential pure albino in both appearance and susceptibility to sun damage. In 2001, he contracted skin cancer and was euthanized two years later. During his time in Barcelona, Snowflake fathered 22 children, none of them albino.